MAGNUS (AUS) (Bay 2002-Stud 2008). 4 wins to 1200m, AJC Galaxy H., Gr.1. Sire of 366 rnrs, 257 wnrs, 14 SW, inc. Malaguerra (BTC Cup, Gr.1), Magnifisio, Great Shot, Platinum Kingdom, Magnapal, Prince of Brooklyn, Miss Promiscuity, The Alfonso, The River, Malibu Style, Volcanic Ash - Volcanic General (Mal. ), Alpha Beat, Missy Cummings, Prettyhappyaboutit, SP Princess of Queens, Gredington, Duke of Brunswick, Manageress, Whistle Baby, Backstedt, etc. FLOURISHING, by Not a Single Doubt. 4 wins to 1200m, A$131,057, MRC (Mornington) Showtime Attractions H., VRC Spotless H., 3d MVRC City Jeep Don't Hold Back H. Half-sister to BELTROIS. This is her third foal. Her second foal is a 2YO. Her first foal is unraced. BELTROIS (Bel Esprit). 6 wins to 1200m, A$397,185, MRC LT Cleary S., L, MVRC Alternate Railway Safeworking H., VRC Red Tempo H., Highpoint H., MRC Danzero at Arrowfield H., 2d VRC Standish H., Gr.3, Bobbie Lewis H., Gr.3, Henry Bucks Best Dressed H., 3d VRC Aurie's Star H., Gr.3, MRC Bert Bryant H., Blazing Saddles H., 4th SAJC Goodwood H., Gr.1. Ruby Lane. 2 wins at 1200m, 1300m to 2016-17 in Aust. Ritzy Belle. Winner at 1200m in Aust. Anne of Brittany. Winner at 1150m in Aust. Flourishing. 4 wins. See above. Vaingtlago. 4 wins from 1300m to 2100m, MVRC Co-Op Pool Shop H.
Trimensa. 2 wins at 1050m, 1100m, SAJC Exelsuper H.
Reindeer Lake. 2 wins at 1000m, 1200m in Aust. Dashing Trois. 2 wins at 1450m, 1600m in Aust. Apres Moi. 2 wins at 1400m in Aust. French King. Winner at 1600m in Aust. Premier Poet. 4 wins at 1100m, 1200m in Aust. Poetic Fortune. Winner at 1300m in Aust. Vaingt Trois. Winner. See above. Captain Toddy. 5 wins from 1200m to 2350m in NZ and Aust. Moranic's Lament - Purple Velvet (Mal.). 5 wins from 1200m to 1600m in Aust. and Malaysia.Class 1 winner in Malaysia. Richlen Lad. 5 wins at 1200m, 1400m in Aust. Forecourt. 2 wins at 2000m, 2100m in Aust. Miss Diaz. 5 wins from 1400m to 2450m, A$133,950, MRC Bronzetti H., Ilumquh H., Valley of Georgia H., 2d Benalla Cup, MRC Winfreux H., Valley of Georgia H., Gladsome H., VRC Bob Skilton H., 3d MRC Morse Code Stayers H., Fighting Force H., MVRC Wedding Expo H., VRC Racing at Werribee H. Producer. TONTONAN (Showdown). Head of The 1973-74 Aust. 3YO & 1972-73 Aust. 2YO (joint) Free Hs. 12 wins-4 at 2-from 1100m to 1600m, A$241,900, STC Golden Slipper S., Gr.1, AJC Doncaster H., Gr.1, Sires' Produce S., Gr.1, All-Aged S., Gr.1, VATC Oakleigh P., Gr.1, MVRC John F Feehan S., Gr.2, VATC Chirnside S., Gr.2, VRC Craiglee S., Gr.2, BATC JT Delaney H., Gr.3, STC Ajax S., L, VATC Trenton S., VRC March Nursery H., 2d VATC Marlboro Cup, Gr.2, 3d STC Todman Slipper Trial S., Gr.3. Timetheus (Showdown). 15 wins-2 at 2-to 1200m, MVRC Oak Park H., VRC Myross H., 3d VRC Ascot Vale S., Gr.2. MOATIZE (Danehill Dancer). 2 wins at 1400m, 2500m, A$605,530, VRC Saab H., Gr.3, 3d VRC Australian Cup, Gr.1, Queensland Derby, Gr.1, STC Ranvet S., Gr.1. Foreshow (Showdown). 3 wins. See above. SERTORIUS (Galileo). 10 wins from 1200m to 2400m, A$1,282,922, MRC Zipping Classic, Gr.2, Easter Cup, Gr.3, 2d MRC Futurity S., Gr.1, VRC Blamey S., Gr.2, MRC Victoria H., Gr.3, VRC Queen Elizabeth S., Gr.3, 3d ATC Sydney Cup, Gr.1, VRC Blamey S., Gr.2. DOLLAR FOR DOLLAR (High Chaparral). 7 wins from 1250m to 1600m, A$303,650, to 2017-18, MRC Sandown S., Gr.3, Ballarat TC Suez McKellar Mile H., 2d MRC John Dillon S., L, 3d VRC Chester Manifold S., L.
MIHALIC (Hard Spun). 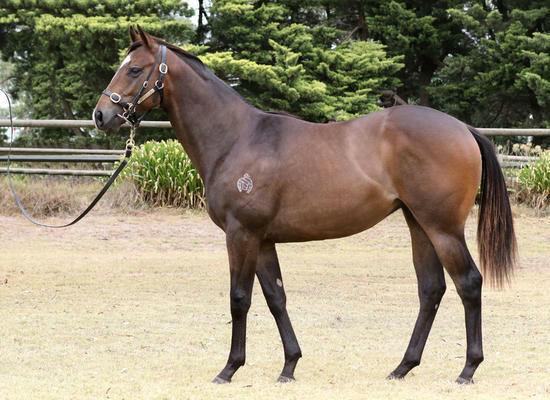 Winner at 2, A$114,400, VRC Maribyrnong Trial S., L, 2d MRC Twilight Glow S., L.